This morning was a little warmer than yesterday, and Mike, AA and I set off from our place to do the CRW J Loop, which starts in Chelmsford. The loop is posted at 55 miles, but when you add the ride to and from Chelmsford, we returned home with a total of 78 miles for the day. I have to say that this ride was harder than yesterday - most likely because I already had 80 miles on my legs, but also because it was a little faster. As we rolled into Hollis, NH to stop for lunch (yup, two days in a row with a lunch stop - Mike must REALLY be on vacation ;)) I was barely hanging on to AA's wheel. After a tasty ham sandwich, we were back on our way home, and I actually felt much better. 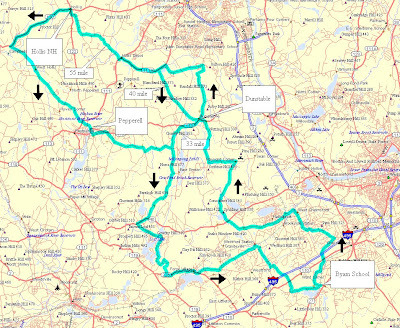 This is a really scenic ride passing through Carlisle, Chelmsford, Westford, Dunstable, Nashua, Hollis, Brookline, Pepperell, Groton, and Forge Village. We passed orchards, working farms some beautiful homes and even crossed a covered bridge. Oh, and we saw a fox on the road as we were coming back into Chelmsford! Another great adventure. If we keep this up, I'm on track for my biggest mileage week of the year ;).